if it wasn't for our Eastern Brothers. the Martial Arts wouldn't be where it is today! many American Martial Artist has taken advantage of the fact that their Martial Arts is Supieror. there is no Supieror Art. its the person him self that makes the Art. sit down and read the Tao of Jeet Kune do! there is so much to learn in the Martial Arts, it takes a life time and I have so much more to learn. even tho, I hold a Ju-dan in Shoju-kempo ryu. you'll never see me bost with it. many Instructors do and you have many young Instructors that have very high ranks. I was 51 when I received my Ju-dan. when I was 48 yrs. old I wanted to be a Ju-dan. then a great Instructor sat me down and opened my eyes, and I forgot about it. then at the age of 51 I was honored to receive my Ju-dan. I began my Martial Arts at the young age of 11 yrs. old. in Hoboken N.J. and New York City. Now that I'm 54 yrs. old there is so much more to learn in the Martial Arts you would not beleave, to so many people I'm Black Belt. but, in my eyes I'm a White Belt. I learn from my students. a true Martial Artist must open his / her mind to understand real Budo! I began my martial arts training October 15th,1964 at the age of 11 years old under my father, Jessie S.R.Martin & Sensei Richard Chun in the Art of Moo Duk Kwon Taekwon-do. - Starting in Sept. 2007 Central High School in Providence, Rhode Island. will have there 1st Traditional Shotokan Karate Culb. Under Prof. Larry S.L. Martin. - Chief Instructor for the Nathan Bishop Middle School Shotokan Karate Club Prov. R.I.
- Chief Instructor for the St. Peter Catholic School Shotokan Karate Club Warwick, R.I.
- Chief Instructor for the Arlengton Elementary School Shotokan Karate Club Cranston, R.I.
- Soke Head Master and Founder of the R.I.SHOTOKAN KARATE HOMBU DOJO'S. - President and founder of the SHOJUKEMPO RYU, SHOJUKEMPO INTERNATIONAL MARTIAL ARTS ASSOCIATION. W.B.B.B. Certified Branch School Instructor. 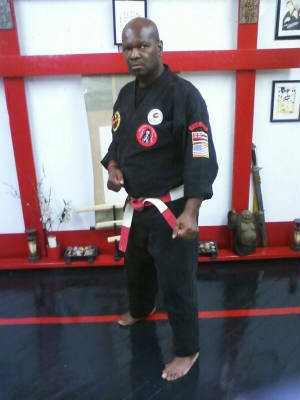 - Cheif Instructor of Bill Gregory's Kajukenpo Martial Arts Studio Pawtucket and Central Falls Rhode Island. - c/o founder for MARTIAL ARTS WOMAN AGAINST DOMESTIC VIOLENCE Awarded as the Highest Ranking Afro American Martial Arts Instructor under Grandmaster William R.Gregory in the State of Rhode Island. - July - 24th 2000 Board member of the International Ryu Kyu Kai Karate Association awarded 7th Dan Black Belt in Shotokan Karate-do, appointed to the board of Directors, 2002 inducted to the Ryu Kyu Kai Karate Association Hall of fame by Dr. Kyoshi Robert M. Handley 8th Dan. and I'm the United States Director for the International Ryu kyu kai Karate Association. - Dec - 13th 2001 awarded Sokeship from Grandmaster George Petrotta 10th Dan Director President of the ISA- International Sungja-do Association for recognition of Shojukempo Karate-do and the Rhode Island State Director with full honors! - Vice President Co founder. ( World Youth Martial Arts Federation ) Vice President Co. founder. - Founder / - President and the (New England Traditional Shotokan Karate-do Alliance) - Founder / President, these Organizations have full Recognition from the top Grandmasters & Associations world wide! - March - 20th 2002 recognition Certification form the United States Martial Arts Federation for SHOJUKEMPO KARATE-DO. - July - 12th 2002 member of the Hawaii Martial Arts International Society. - July - 1st 2002 awarded Hanshiship from Grandmaster Montezuma C. Cantu 10th Dan President Ceo of the International Black Belt Federation with appointed letter as Ambassador to Europe an Canada for the Martial Arts. Plus Board Member and Director for the Japanese Karate-do Division in Rhode Island under the All Japan Okinawan Karate Association. - Sept - 2002 received Certification for 9th Dan. As a member of the Karazenpo Goshin Jutsu Black Belt Society with " SHOJUKEMPO KARATE-DO recognition from " Sonny Victor Gascon " 10th Dan founder of Karazenpo Goshin Jutsu. - Dec - 28th 2002 received B- Class Certification 6th Dan. Chief Instructor, Examiner, Referee from the World JKA Karate Alliance and Rhode Island State Director. - June 20th 2003 appointed as the Rhode Island President for the Karazenpo Go Shinjitsu Black Belt Society under Grandmaster Victor " Sonny " Gascon 10th Dan founder of Karazenpo Go Shinjitsu. - Aug. - 28th 2004 the International Ryukyukai Karate-do Association recognized me as 10th Dan and founder of Shojukempo, Shojukempo International. Kyoshi Dr. Robert M. Handley President International Ryukyukai Karate-do Association and Grandmaster Al Cunningham Vice President North American Grandmasters Council. March 18th 2006 Hall of Fame Inductee International Ryukyukai Karate Association Shojukempo International . hosted by Dr. Robert M. Handley. June 06th 2006 became a member of the Japan Karate Shotokai Reimai under Master Asai & Yokota Sensei.